By chance, a friend sent me a clipping on an exhibit presented by the American Folk Art Museum in New York City a few days before a scheduled trip to Manhattan. 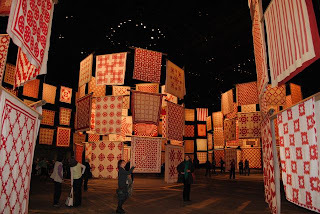 It sounded intriguing - 650 red and white quilts hung in the Park Ave Armory. The exhibit, "Infinite Variety: Three Centuries of Red and White Quilts," was amazing. 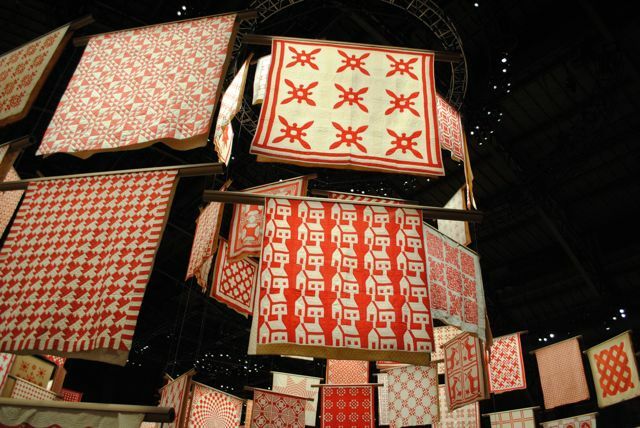 The quilts were hung in levels from the Armory ceiling. All were from the collection of Joanna S Rose and were exhibited free of charge to the public. Her husband sponsored the exhibit as an 80th birthday present for Joanna. 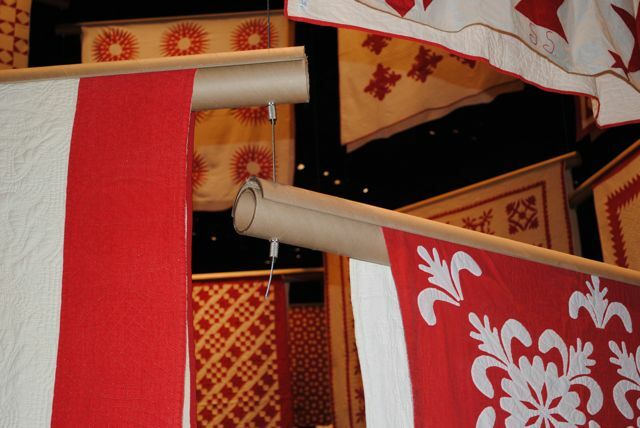 These six hundred and fifty American quilts from three centuries are not the prizewinners at fairs nor ones that have been passed down in families, cherished by several generations. They are, rather, ordinary coverings, their creators largely anonymous, their provence obscure, not meant for company beds or "best use." 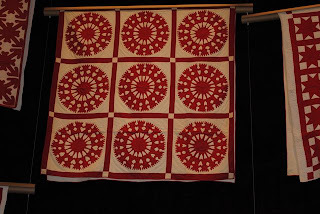 The quilts were absolutely stunning. 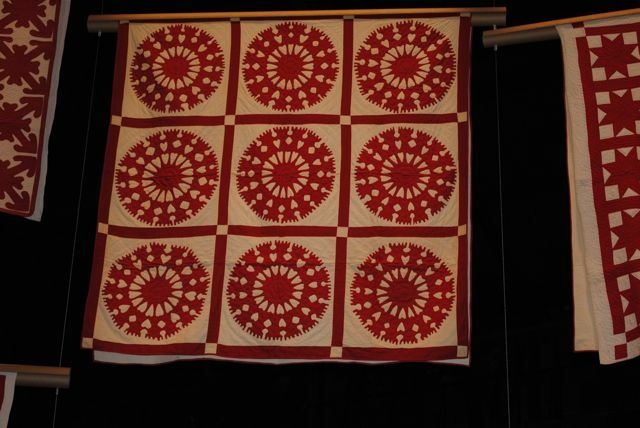 I was fascinated by how the quilts were hung. The layout was designed by the New York City firm Thinc Design. 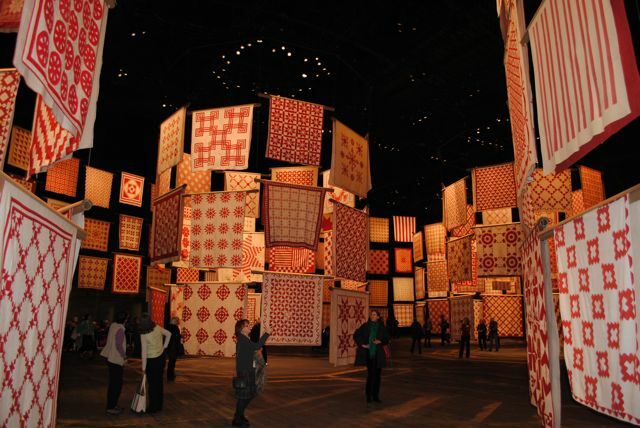 The quilts hang in layers from circular metal frames suspended from the ceiling. Each quilt is mounted by clips to a circular cardboard tube. The mounting clips are covered by a second cardboard tube cut in half. 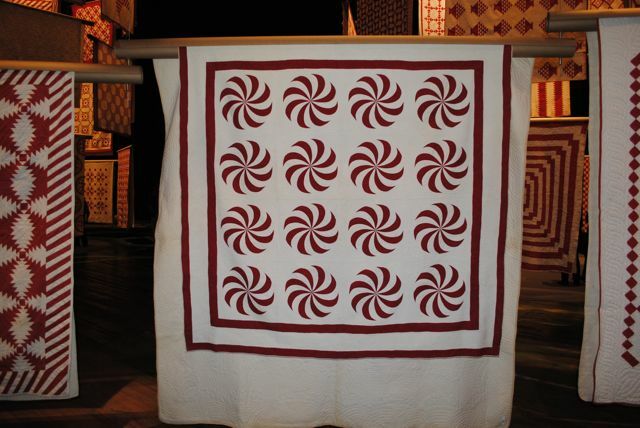 The quilts are hung in pairs, matched in size. The quilts are hung back to back from cardboard tubing. There were countless designs represented in the exhibit. 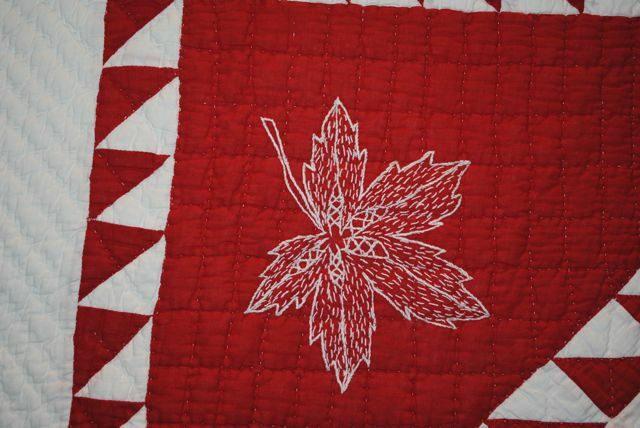 Here are a few of my favorite quilts. The exhibit is only on display for six days and ends on March 30. If you are in the New York area for any reason, it is definitely worth visiting. What a wonderful exhibit! I'm a great fan of redwork, so was surprised to see the R&W expressed more in fabric, and less in embroidery. Intriguing hanging style, too. Thanks for sharing this! thanks for sharing these photos. what a spectacular display! Wow! What a fantastic exhibit. 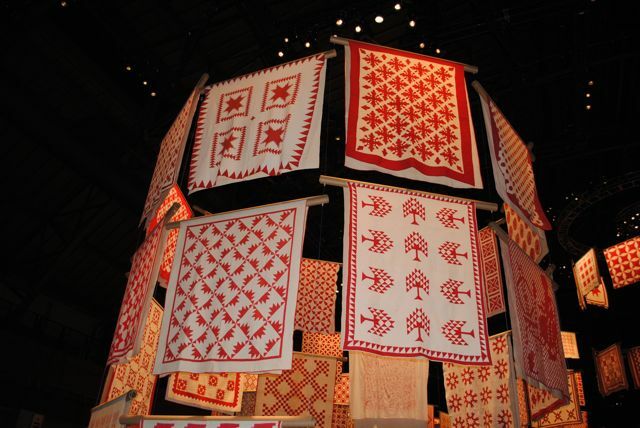 The hanging was as exciting as the quilts themselves. My Alaskan friend traveled to NY to see this, she will be surprised when I tell her I got a glimpse also. :) Thank you for sharing. These are but a few photos. There have been an abundance of photos published by others on the web too so I am sure you can find more if you do a google search. It was a wonderful gift for everyone, wasn't it!